A two-day siege in Somerset has ended peacefully. Kevin Philips, who has been barricaded inside a house in Burnham-on-Sea since Monday morning, gave himself up at 2100 BST on Tuesday. Armed police had surrounded the house, as Mr Philips, 40, was believed to be armed with a machete. 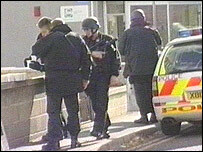 A police spokesman said: "The siege came to a safe and peaceful end at 2100 BST. "The man involved was getting closer to negotiators throughout Tuesday and invited them in at 2100 BST. "He then gave himself up peacefully and was arrested." Mr Philips has been taken to Musgrove Park Hospital for treatment. It is hoped that all the roads closed due to the siege will be open by Wednesday morning. Earlier on Tuesday evening, Mr Philips' mother had walked out of the house. The 60-year-old was never thought to be a hostage and left just before 1800 BST. She is believed to be unharmed but is being examined by paramedics. It is thought that Mr Phillips is angry at plans to build a superstore near his home in Oxford Street, and has been involved in a dispute with the local council over rubbish and scrap metal in his front garden. "She walked towards waiting police"